Posted November 8, 2016 by jordannet66 & filed under Blog. Are you thinking about getting a loft conversion for your home or commercial building space? There are many different advantages for having a loft conversion done. If the space is available and the right budget is in place, loft conversions offer a genuine return on your investment for the long-term gain. 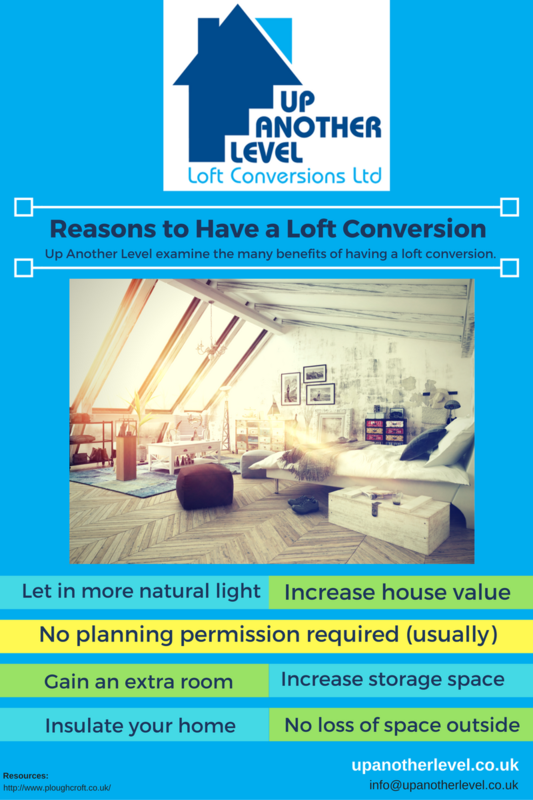 Here, at Up Another Level, we have put together this handy image to showcase some of the different benefits which loft conversions have to offer. Whilst this does sound like a huge project to undertake, it can be relatively straight forward to carry out, using the right team of experienced professionals. Let in more light – By including large Velux windows in a loft conversion, more natural light can shine through the space which will help reduce the need to use electrical lighting in the room. Increase house value – The property value of the house which includes a loft conversion, can be increased by up to 20%. Having more room in the house which has been properly converted as usable living space will help increase the value of your house. No planning permission required (usually) – Whereas planning permission is usually associated with getting a house extension, it is not usually needed for loft conversions, since it involves converting existing house space, rather than building externally. Another benefit is that you do not need to inform the neighbours and probably won’t disturb or upset them. Gain an extra room – If your house has every room filled with furniture, or used by different people, getting a loft conversion will mean you gain an extra space to use, from a home office room to a spare bedroom. Increase storage space – Avoid having to use storage space elsewhere in the home and get all the extra room you need, by converting the existing space in your home that was previously unusable. Insulate your home – Attics and lofts which are poorly insulated tend to lose up to half of their heat. By having a loft conversion, you can significantly lower your energy bills every year. No loss of space outside – By extending the room in your house vertically, it means you don’t have to lose any garden space outside, so you won’t need to invest in a bigger garden shed or cut down your garden size. What to know more? Here at Up Another Level, we have been specialising in loft conversions for over 15 years and have a team of experienced professionals who have the expertise to assist you. We cover most areas in and around The Midlands, including Birmingham, Bromsgrove, Redditch, Coventry, Stratford Upon Avon, Warwick, Solihull and Worcester. Give our loft conversions experts a call on any ofthe featured contact telephone numbers from our ‘Contact Us’ page or, alternatively, fill in the enquiry form online for a quick response.